LAS VEGAS, Feb. 20, 2016 – Three-time U.S. champion Sam Mikulak of Newport Beach, Calif./Team Hilton (U.S. Olympic Training Center), won the all-around title at the Winter Cup Challenge inside Las Vegas’ Cashman Center. Akash Modi of Morganville, N.J./Stanford University, finished second, followed by Sean Melton of Columbus, Ohio/Ohio State University. Mikulak, who was making his return to competition after an Achilles sidelined him late last year, posted an all-around total of 90.350 tonight, giving him a two-day score of 177.450. He was brilliant on the parallel bars where he began his night with a 15.750, flying high through a dynamic routine. On the high bar, he soared on a full-twisting double back over the bar, called a Kohlman, for a 15.150. He posted a 14.200 on the floor exercise and added a 15.250 on the pommel horse. He stuck his tucked, double-twisting double back still rings dismount to earn a 15.050. In the final rotation, he posted a 14.950 for his Kasamatsu one-and-a-half vault. Modi took second place, posting a 175.300 over the two days of competition. Melton earned a total score of 174.500. 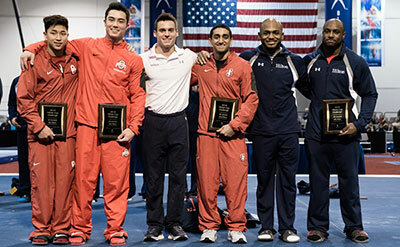 2012 Olympian John Orozco of the Bronx, N.Y./Team Hilton (U.S. Olympic Training Center), 174.350, and Yul Moldauer of Norman, Okla./University of Oklahoma, 174.100, rounded out the top five in the all-around. In addition to the all-around crown, Mikulak also picked up top honors on pommel horse with a 30.600 two-day total and high bar, where he posted a 30.200 combined score. Eddie Penev of Penfield, N.Y./Team Hilton (U.S. Olympic Training Center), took the top spots on floor, 30.350, and vault, 30.700. Donnell Whittenburg of Baltimore, Md./Team Hilton (U.S. Olympic Training Center), who finished sixth in the all-around, won the still rings title with a 30.800 two-day score. Melton was the winner on parallel bars with a 29.100. 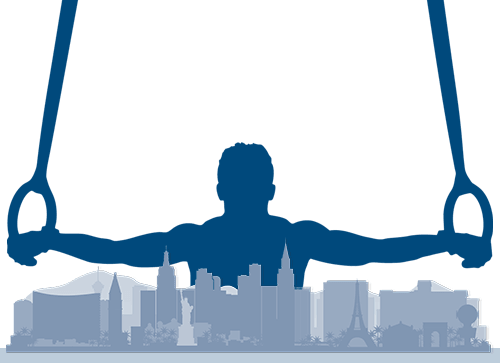 Performances at the 2016 Winter Cup Challenge help determine the 15 men who will comprise the U.S. Men’s Senior National Team through the 2016 P&G Gymnastics Championships in Hartford, Conn. June 3-5. The six members of the 2015 World Championships squad, plus the alternate, retain their spots on the national team. The remaining eight spots will be determined based on the following criteria: the top three ranked all-around athletes who are not already on the senior national team; two based on the National Team Points System; two athletes selected by the Men’s Program Committee; and one selected by the national team coordinator.